Japan's earthquake in March is set to make 2011 the costliest year to date for natural disasters, reinsurer Munich Re said on Tuesday, although the number of deaths globally is relatively low so far. Total global losses from natural disasters for the first six months alone were $265 billion, easily exceeding the $220 billion recorded for the whole of 2005, previously the most expensive year to date, the German firm said. The economic loss for the first half of 2011 was more than five times higher than the average of the past 10 years, Munich Re said, and more than double the total for 2010 of $130 billion. Moreover, first-half losses are generally lower than second-half losses, which are often affected by hurricanes in the north Atlantic and typhoons in the northwest Pacific, Munich Re added. Not all the damage will be covered by insurance companies however, with "insured losses" in the first six months some $60 billion, nearly five times the average since 2001. "It is very rare for such an extreme accumulation of natural hazard events to be encountered," Munich Re, which is the world's top reinsurer, said in a statement. The 9.0-magnitude quake on March 11, the strongest ever registered in Japan, caused losses of 210 billion euros, making it the costliest natural catastrophe on record, surpassing even Hurricane Katrina in the United States in 2005. Katrina, which pummelled the southern United States in August and caused devastating flooding that swallowed 80 percent of New Orleans, caused $125 billion worth of damage. Insured losses from Katrina were much higher at $62 billion, however, more than double the $30-billion bill for the Japanese quake, which also knocked out cooling systems at the Fukushima Daiichi nuclear plant, leaking radiation. The quake was also the biggest catastrophe to occur in the first half of 2011 in human terms. At least 15,500 people died and and thousands are still missing after the earthquake and the subsequent tsunami, which devastated entire cities along the northeast coast of Japan, Munich Re said. In terms of the human cost overall, however, 2011 is relatively benign -- so far. Natural disasters killed 19,380 people in the first six months, compared to 230,300 in 2010. In January 2010 an earthquake in Haiti killed some 225,000 people, while more than 50,000 perished in heatwaves and forest fires in Russia. Thousands also died in earthquakes and floods in China and Pakistan. The total number of loss-relevant natural events in the first six months of 2011 was 355, somewhat below the average for the previous 10 years of 390. 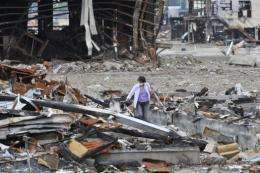 The next costliest natural disaster in the first half of 2011 was a severe earthquake that shook Christchurch, New Zealand, in February, causing $20 billion in damage and killing 181 people, Munich Re said. Severe storms in the southern and midwest United States in April and May killed 520 people and caused $14.5 billion in damages, with insured losses around $10 billion. Floods in Queensland in northeast Australia in December and January caused $7.3 billion in damage, $2.6 billion of it insured, and killed 35 people. Scientists warn of more quake danger in N.Z.